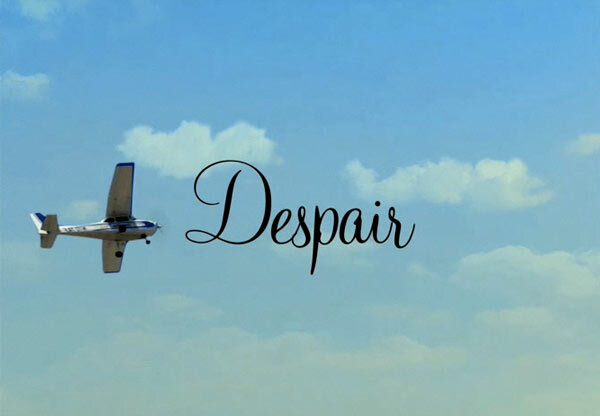 LA-based photographer, Alex Prager’s first short film “Despair” is going for pure, cinematic melodrama, hoping to catch just one emotion—despair—through her chilling juxtaposition of dreamy Americana aesthetics and back-story brimming with overstated tragedy. The setting: 1960s Los Angeles. Inside a phone booth stands a beautiful woman wearing the portentous femme fatale uniform of red lipstick and high heels. Bright and eerie, it’s picture-perfection. Set to a score by composer Ali Helnwein and starring model and actress Bryce Dallas Howard, the film takes its cues from the opening of Charles Laughton’s Night of the Hunter (1955), and the Hans Christian Andersen-inspired 1948 ballet The Red Shoes. According to Prager, Despair was conceived as a living, full-sensory version of her photographic work, which has previously been exhibited at M+B Gallery in Los Angeles, Yancey Richardson in New York and Michael Hoppen in London. “I’d like to show the before, now and after of one of my images––that’s really the concept of the film,” she says. Accustomed to running a one-woman show on her shoots, where she usually plays photographer, stylist, set-designer and everything in between, Prager was ensnared by the collaborative nature of creating a film. “It’s like taking every art medium and melding it into one,” she says. “It’s incredible!” As for working with Howard, a fast-rising talent (and the daughter of director Ron Howard) best known for her performances in M. Night Shyamalan’s The Village and Lady in the Water, Prager credits fate for bringing them together. She knew it could be no one but the fair-skinned beauty after deciding the role called for a redhead with serious acting chops. Howard’s graceful, porcelain-like look seems to embody one of Prager’s defining characteristics as an artist—her unabashed love for, and understanding of, color. As for suspense: one of the stills from the four-minute film is headed to the prestiguous MoMA this September for the group show New Photography 2010, where Prager is exhibiting alongside Elad Lassry, Roe Ethridge and Amanda Ross-Ho. Film stills from Despair are currently being exhibited and sold exclusively by Michael Hoppen Contemporary in London.